The Rebel Sweetheart. : London 2012 | Hobnobbing, Star-spotting! If plane tickets and a gold credit card are all that I need to go to London, then most likely I won't be here - at home, in the Philippines, blogging. After watching the opening ceremony and witnessing the Olympic Torch being lit, the little man has been bugging me like crazy to go to London so he could see the 'big fire' (as he calls it) for himself. He kept on asking for this incessantly, to the point where you just want to give in to his whim just so he would stop nagging. Unfortunately, the little man and I don't have a British visa, unlike Mum who now happens to be a citizen. 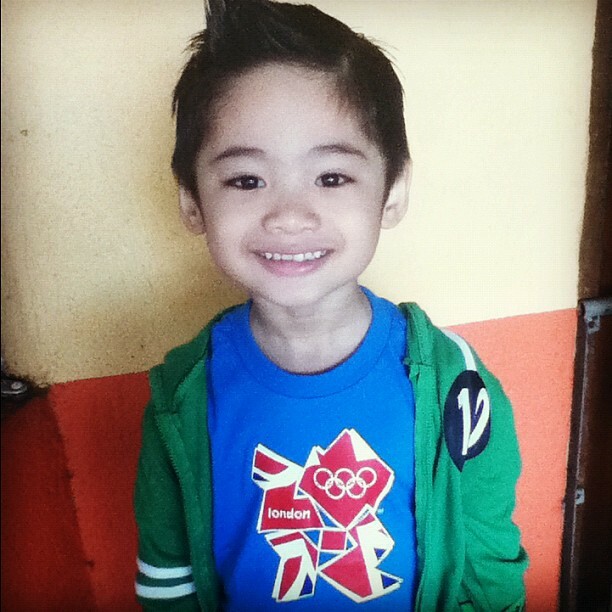 To pacify him a bit, I made him wear his London 2012 shirt set to school the other day. Wednesday is wash day, so they don't have to wear their school uniform. Meanwhile, in Westfield, my cousin John and his friends are on a school break and enjoying the crazy, fun, sublime atmosphere of the Olympics. 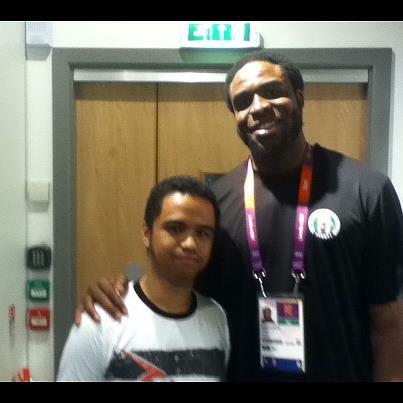 He even had the chance to meet athletes on several occasions. 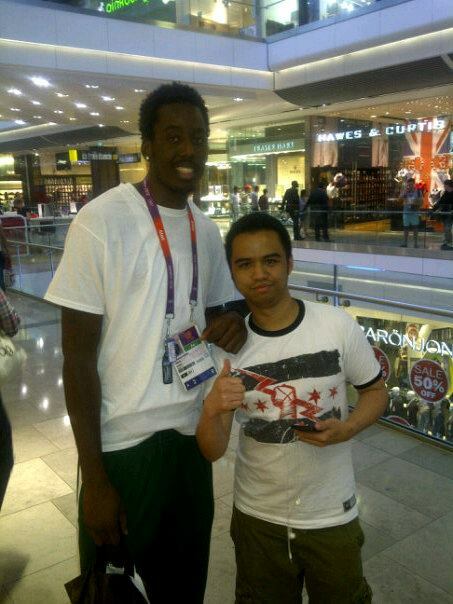 Ike Diogu of Hornets/LA Clippers. Al Faruq Aminu of the New Orleans Hornets. Our very own Bulilit, Mark Barriga! 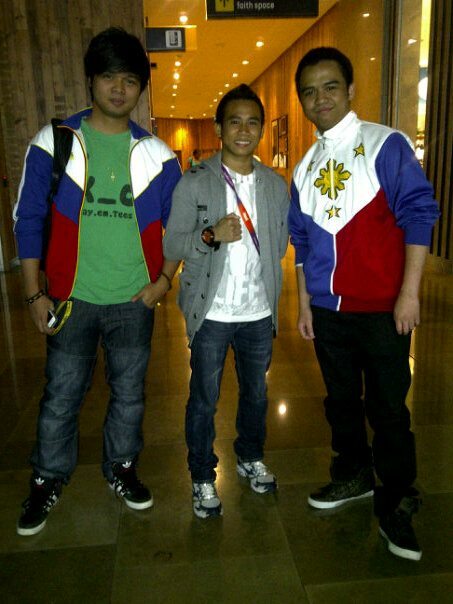 As you can see, my cousin and his friend Fernan are still proud Pinoys, despite their British citizenship. My cousin even calls out Mayweather in this interview with EsNews. And Fernan calls him a 'relic of the past', LOL! Cockney usually amazes me (Gordon Ramsay's in particular), but hearing it from my cousin just made my migraine recur. Hahaha! Peace, brother. See you in December! It is my dream as well to watch the Olympics in London. 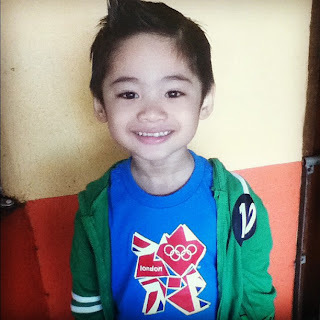 Your son is so cute on his London Olympics shirt! Like you and your son I also wanted to witness the London Olympics. Your cousins are so lucky! They ought to take more photos so you could blog about the athletes that they will encounter. My husband enjoys watching it and I did catch Women's Weightlifting the other night. I am just out of words how heavy these women can lift! London is truly one of my favorite cities! We're heading there the end of the month actually:) One of our friends has such a strong accent, that sometimes I still can't understand her after all of these years. Oh, i want to go too... :) It's neat that your little guy wants to go, mine roll their eyes when I put the Olympics on right now (I'm sure they'll enjoy it more when they're older).